Fluor Corporation has been awarded a $185m contract with Qatar’s Public Works Authority (Ashghal) to provide program management and construction supervision services for the $5bn Sharq Crossing program – previously known as the Doha Bay Crossing program (http://www.constructionweekonline.com). 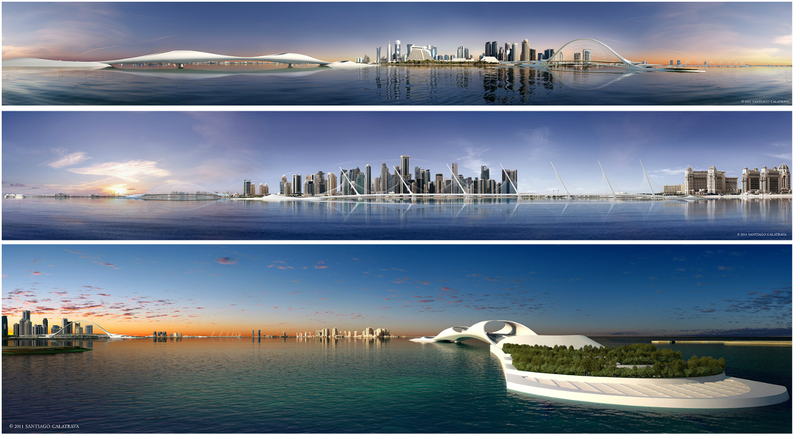 The Doha Bay Crossing Masterplan has been developed by Santiago Calatrava at the request of the Ministry of Municipal Affairs and Urban Planning (MMUP) and features a unique combination of an efficient civil engineering solution and a highly iconic design. The Masterplan features a major traffic connection linking the Airport area with the West Bay Financial District and the Cultural City. Substituting of the tunnel system. The connection of the bridges to the previously proposed traffic system follows the same principle at all three locations – a short tunnel underpass runs below the coastal district allowing the bridges to emerges offshore before descending beneath the sea to connect back to the main road tunnel. In this way, each bridge reads as an individual sculptural piece with distinct character drawing on the constraints of the adjacent urban environment (http://www.calatrava.com). As published at official website of Doha International Airport, The New Doha International Airport (Hamad International Airport) will be opened in 2013. The exact schedule of opening will be announced later by QCAA. This great new airport located in 590,000 square meters at the edge of Arabian Peninsula. Hamad International Airport will able to accommodate 28 million passengers per year. The project includes a 270,000-sq.-ft. retail gallery, a 23,000-sq.-ft. public mosque, two 100-room, five-star transfer hotels, a health spa, a 3,431-car parking garage, five operations centers, four central utility plants and a 742,000-sq.-ft. flight catering facility. In conjunction with Lea+Elliott, HOK designed a 765-yard-long internal automated people mover system (www.hok.com). The 8th Doha International Oil and Gas Exhibition (8th DIOGE) will be held from the 7th – 10th October 2013 at the Doha Exhibition Centre. The 8th DIOGE will showcase the latest technologies and development of the gas industry. This will become the major meeting forum, from which commercial activities can be accomplished.